There are over 100 exciting programs and activities to do at the festival so it can be a daunting task to choose which ones to go to! So we take the liberty and curated 10 things that we think you shouldn’t miss when you are at the festival. Festival is open rain or shine. Come out and celebrate the 50th anniversary of the Northern California Cherry Blossom Festival by joining us in the first annual Scavenger Hunt! To get started, download the Goosechase app (iOS and Android)! Then, search for “Cherry Blossom Festival Scavenger Hunt” and join the game! Participants will be given missions to visit the various businesses and attractions within Japantown, in the process will learn a little bit more about Japantown and all it has to offer. 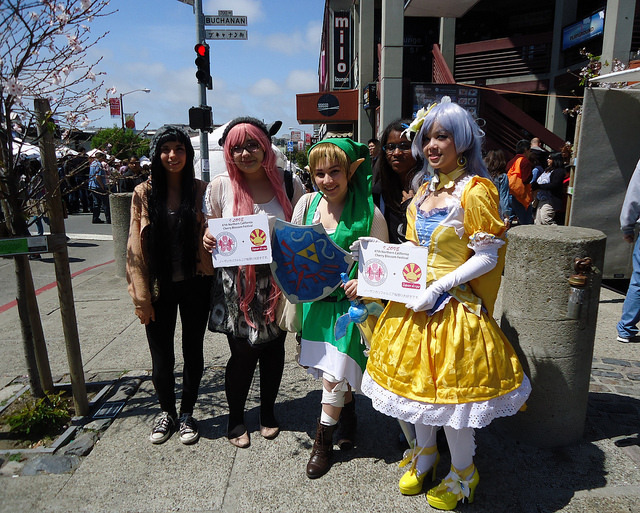 Prizes will be awarded to top players, including Cherry Blossom Festival Experience packages. Discover the treasures of Japantown through the Cherry Blossom Experience! The very first Cherry Blossom Film Festival showcases six of Japan’s best films and anime, reflecting the diverse and unique legacy of Japanese Cinema. All films will be shown in Japanese, with English subtitles (unless otherwise noted). Cherry Blossom Film Festival is held on April 8, 9 and 15, 2017 at the NEW PEOPLE Cinema located in the heart of San Francisco’s historic Japantown. You can buy tickets online. To make this gala truly a memorable experience, the celebration will be held at San Francisco’s iconic and historic Westin St. Francis Hotel in Union Square with a cocktail reception, an elegant sit-down dinner and an evening of special entertainment. Jana Katsuyama from KTVU Channel 2 News will be the gala’s Master of Ceremonies. Amongst the special guests attending the gala are the festival’s Grand Parade Grand Marshal – 3 times sumo wrestling champion, Konishiki Yasokichi and the Cherry Blossom Festival Queen and Court. The gala’s program includes taiko drumming by the Buddhist Church of San Francisco’s Taiko Kids and Jiten Daiko, mochitsuki, a Japanese tradition of pounding of sweet rice to make mochi perform by the Kagami Kai Group, and a number of groups from Japan performing dances. There will also be a silent auction with fabulous prizes like a hotel stay package, sake, wines and artisanal arts and crafts generously donated to the gala. A bigger than ever Sakura 360 area is coming back to the festival and expanding to two weekends, April 8th and 9th, 15th and 16th. The first weekend will feature anime and pop-culture themes with the 2nd weekend featuring gaming. The area continues to embody the spirit of the “new Japan”, involving fashion, gaming, and anime that are currently trending in both America and Japan in a cross-cultural flavor. This year Sakura 360 area will be located on Buchanan Street, between Sutter and Bush. 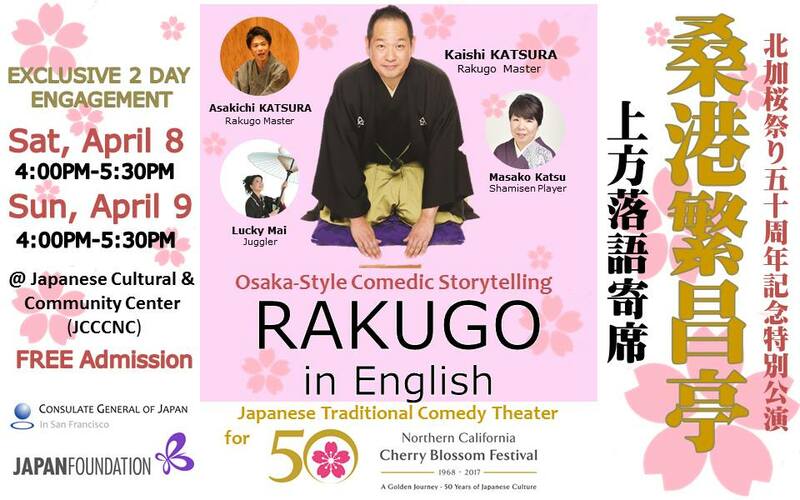 In another celebration in honor of the 50th Northern California Cherry Blossom Festival and 60th anniversary of sister city relationship between San Francisco and Osaka, the Consulate General of Japan in San Francisco and the Japan Foundation present a special traditional Japanese kamigata (Osaka-style) rakugo comedy and variety entertainment show during the Northern California Cherry Blossom Festival. In addition to English Osaka-style rakugo, this show will feature Japanese traditional juggling and shamisen performance. It will be held Saturday, April 8 and Sunday, April 9; 4-5:30pm at the JCCCNC Stage (Japanese Cultural and Community Center of Northern California; 1840 Sutter Street, San Francisco, CA 94115). Admission is free. 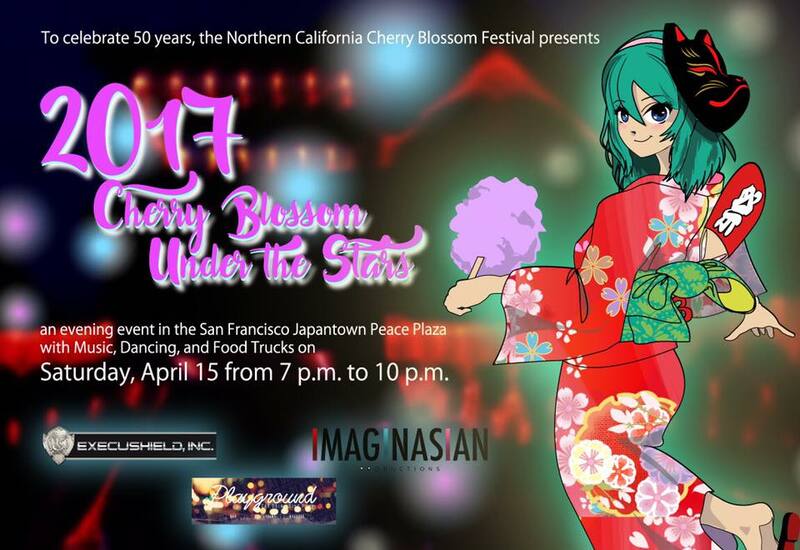 For the first time in the cherry blossom festival history, there will be an evening program at Japantown for all to enjoy. Join us at the official night time event “Cherry Blossom Under the Stars” on Saturday, April 15th from 7pm until 10pm. If you can’t make it to the festival during the day, you can still join in the spirit and fun of the cherry blossom festival. There will be tasty food trucks, a beer booth, and stellar live entertainment. Families with children are welcome to visit Sanrio Kids’ Corner, April 8, 9 & 15. The Hello Kitty Cafe Truck will make its 3rd appearance on the 1st festival weekend and will be in the Hello Kitty Area of the festival. Additionally, special 50th Anniversary Hello Kitty gear is available at Amiko Boutique in Japan Center West Mall. This area is located at Webster and Post streets. Commemorating the 60th year of Osaka-San Francisco sister city relationship, an amazing Kimono show from the Hiro Kimono School is going to be held. Various kinds of Kimono will be shown on the our second weekend, Saturday, April 15th at 1pm at the Sundance Kabuki Cinemas. Admission is free. 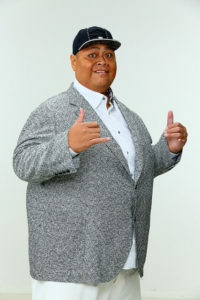 We are proud to announce Konishiki as the Grand Marshal for the 50th Annual Northern California Cherry Blossom Festival Grand Parade. Born Saleva’a Fuauli Atisano’e, Konishiki is a Hawaiian-born former sumo wrestler of Samoan descent. Konishiki became the first non-Japanese born sumo wrestler to reach ōzeki, the second highest rank. During his 15-year career, he won 3 championships in the top Makuuchi division and garnered 733 wins. Have a chance to meet him on the second weekend , 4/15 and 4/16. 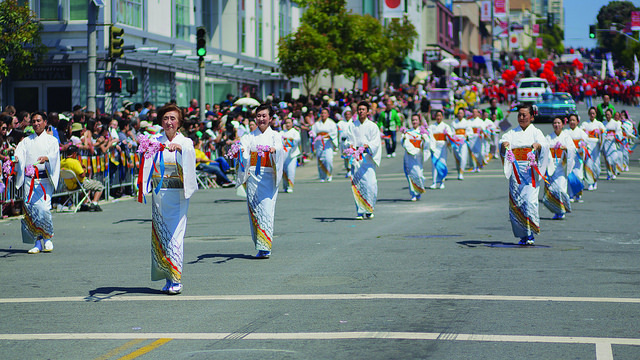 The Grand Parade on April 16th begins at Civic Center at 1pm, proceeding up Polk to Post Street, and ending in Japantown at Post and Fillmore streets. We hope this list of 10 things to do inspire you to come have some fun at the festival. Bring your friends, family and dogs this weekend and don’t miss any of this or other programs created exclusively for the San Francisco Cherry Blossom Festival. Be part of the fun and celebrate a historical event with us!